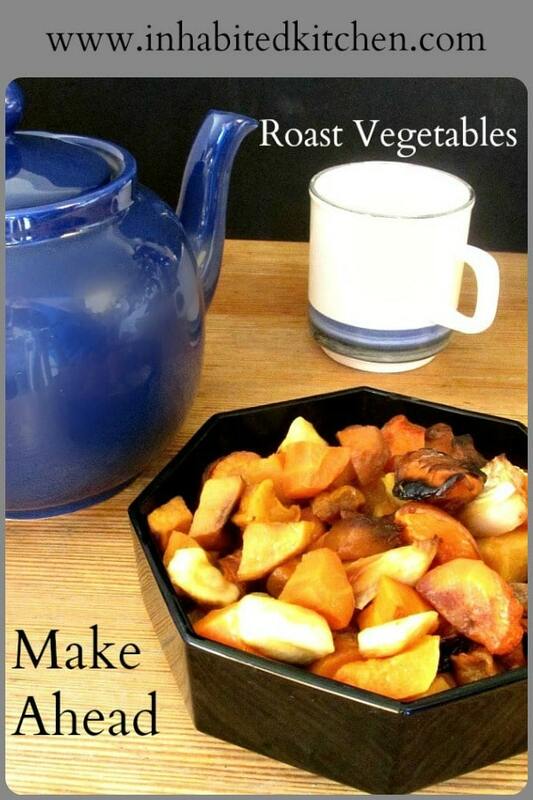 Roast Vegetables – an easy make ahead dish to use in a Meal Plan, to simplify holiday cooking! First, of course, there are the actual celebrations of the holidays themselves. Many of us travel for Thanksgiving or Christmas, or entertain family and friends who have come over the river and through the airport to our house. We’re roasting the turkey, or cooking – and packing and carrying – the lasagna or the mince pies, frying the latkes, or baking the cookies. In between all this, you still expect dinner? Well, yes. In fact, the busier you are, the more you really need a decent meal. For years, I worked as a vendor in stores, long hours every December. I did that for the flexibility that let me work as a costumer – but then I got a gig with a show that went up the first week in December every year! I ate much too much canned soup in December for several years, but then started planning more, because I knew I needed to eat better. And then I acquired Rich (who, left to himself, would eat more canned soup…) and the next thing I knew, I was baking chicken and making meatloaf ahead of time. And so, Planning For Meals began. I finally developed what is, in fact, a modular system. I make sure I have a series of modules, so to speak, on hand, which fit into certain slots on a meal plan. Once you get started, it is a very easy system to follow. For instance… the other day I took a bit more than half an hour – perhaps as much as forty five minutes? – to clean and chop vegetables. I was deliberately cleaning out the crisper drawer – if you don’t have a farm share buildup, you might want to do it in smaller batches. 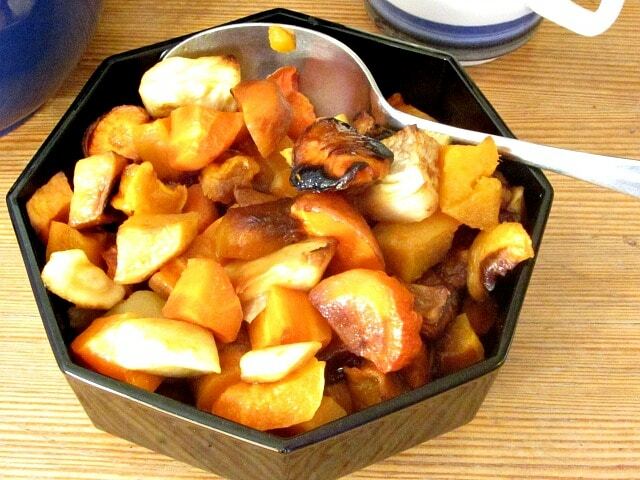 Then I roasted them – a variety of root vegetables and winter squash. The big roasting pan I filled took an hour, a batch half that size often takes only forty five minutes. 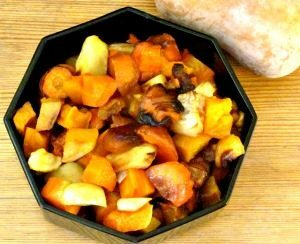 We ate some right away, of course, and I made some into soup today for lunch, but I still have a couple of quarts of roasted vegetables, which reheat beautifully and can be used in many ways. If you feel like it, you can make a batch of roast vegetables this week to get yourself started. Keep some in the fridge, and use it now, but freeze some – and you will be ahead of the game. Start with carrots – everyone can easily get carrots. We’d gotten some massive ones – I kept a few smaller ones aside to keep using in salad and the like, and chopped half a dozen of the big ones. I had some parsnips, too – also a sweet vegetable but a different flavor. A couple of peppery rutabagas, for contrast, and a few kohlrabi that had hidden in the back of the crisper. (Surely they hid – I couldn’t have simply forgotten about them – could I?) Then a butternut and a kabocha squash. I didn’t include onions, this time – they’re a renewable resource, in this house, and I didn’t want to take the freezer space. By all means add them if you want – garlic, too. And the same for potatoes – they’re great in the mix, especially if you want it to stand alone – but I’ll use some of it in soup and sauce, and decided against using them this time. 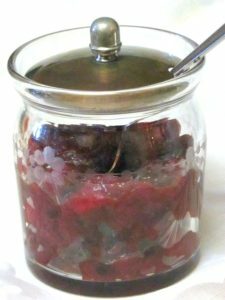 I don’t add beets, though they’d be delicious, because the color bleeds all over – I roast them by themselves. If you have golden beets, though, go ahead. White turnips might go in another time, or daikon radish… I’ve never used celeriac – it’s expensive, here, so I use it alone to feature the flavor – but if you have it, that would be a lovely addition. Basically, use what you have, or what sounds good to you. Wash, trim, peel as needed, and cut everything into bite sized pieces. 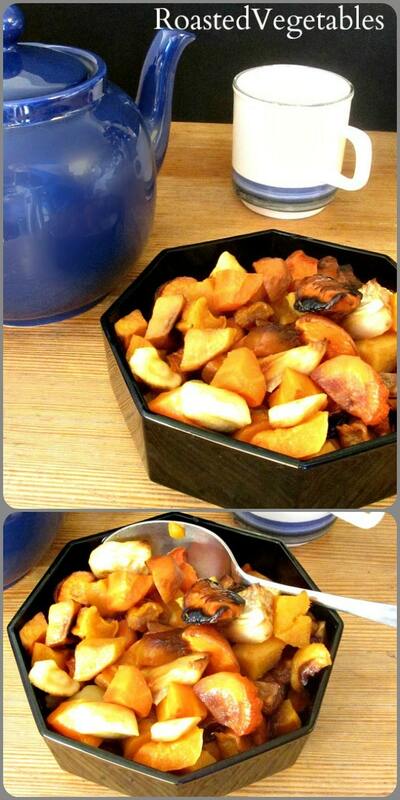 You probably don’t want to fill the turkey roaster, especially the first time… I really needed to move the vegetables! But fill, say, an 11″ x 7″ baking pan… that will give you some for dinner tonight, and enough to use a couple of times in future. Then put the pan in a 400°F oven, and roast until softened and starting to brown a little. I check, and stir away from the edges, at half an hour, and then usually give it another fifteen minutes (though the larger pan took longer.) Timing will depend a little on the moisture of the vegetables, as well as your oven, your baking pan, and all that. This will last a few days in the refrigerator, or you can freeze it. I like to fill and flatten zip bags, as then I can break off chunks as needed. Otherwise, divide into amounts you can use at once. 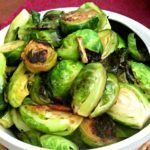 Roast Vegetables - an easy make ahead dish to use in a Modular Meal Plan, to simplify holiday cooking! Take an assortment of vegetables that pleases you. Wash, trim, peel as needed, and cut into bite sized pieces. Place in a baking pan. Sprinkle with salt, and stir well, to distribute salt. Dribble olive oil over it - start with two tablespoons. Stir well to distribute oil, adding more if needed. Roast at 400 F for 45 minutes to an hour, until soft and slightly browned. At the half hour, stir vegetables in the pan, moving the ones near the outside into the center so they cook more evenly. Roast Vegetables keep, freeze, and reheat beautifully, making them a perfect dish to cook ahead for later use on a busy day. Roasted veggies are so great! Aren't they? Roasting brings out the sweet flavor, instead of washing it all away by boiling. Amazing how good a simple carrot can be. What a nice idea! I never tried roasting mixed vegetables but I should! I've only been doing it the last few years - that crisper full of one of this and two of that from the CSA inspired me. But the mixture is really so good - a range of flavors that all balance each other. These days I buy a variety in winter to mix them. And thank you! I hope you enjoy them! I never knew you could freeze roasted vegetables like this. I will have to try it as it absolutely reduces your time in the kitchen. It really works amazingly well. And honestly - I have a quart in the freezer, but also a quart in the fridge and I've been eating them all week - *major* time saver! 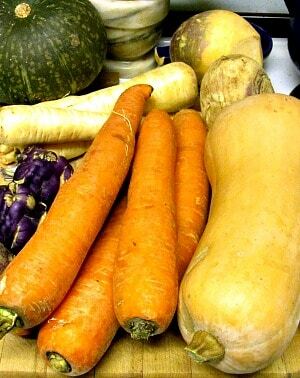 This is the perfect season for root vegetables! I love turnips and parsnips. 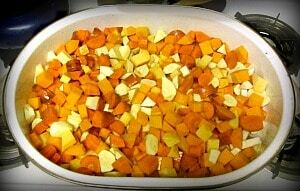 Your make ahead root veggies are great for busy weeknights and I'll be sure to make this soon :) Thanks!! Terrific! Thank you, and enjoy them! I love anything that can be made ahead! Absolutely! Especially now, that we're coming into a busy season. I'm doing as much ahead as I can, to save time later, when I have less! Love roasted veggies! These look great. This sounds delicious! How do you suggest reheating them after freezing? I can't wait to try it! Thank you! You can really reheat these almost any way you want to. The microwave, of course, is fastest and easiest. But because of the way they're cooked, you can use other methods without worrying about overcooking, so you can do whatever is convenient with the rest of the meal. Just make sure you don't dry them out. So - if the oven is on, put them in a covered casserole and bake. (15 minutes or so? Timing will depend to some degree on how much you are reheating.) Put them in a saucepan with a little water, cover, and place over low heat. Easier yet, drop into a sauce or soup! (I love them as a base for a rich vegetable soup.) And enjoy! Love this sort of comfort food this time of year, and you're a genius for finding a way to make them ahead of time. LOL - It's easy, really - they just reheat so well! Thank you! I hadn't heard the term modular used like this before, but I'm loving it! And roasted veggies are SO great to have on hand - I love cleaning out the crisper drawer like that, too! Thank you! I was trying to find a way to talk about all the pieces that make up a meal... because that can make preparation easier. So smart! I need to do this type of prep more often so I can always have healthy and delicious food like this at the ready! Thank you! It makes life so much easier! Sometimes when I'm busy I don't make time for it - and then I always regret it, because cooking meal by meal takes more time, in the long run. Mmmmm. 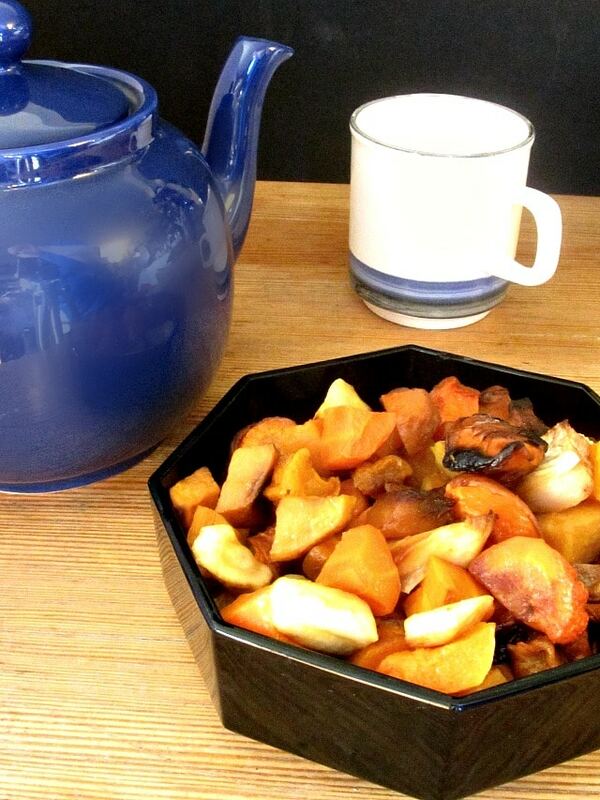 You know there's a change in the season when there's the smell of roasting root veggies in the chilly air. I like doing up a big pan, enough for sides dishes and salads for the rest of the week. So economical too!